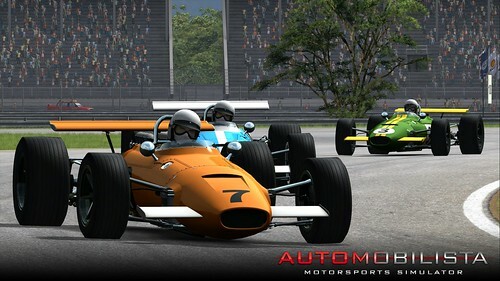 Renato Simioni of Reiza Studios has published the July Development Update for the popular Automobilista racing simulator. In this development update, Renato outlines the recent progress made on their road to AMS V1.0 and what´s coming beyond. Furthermore, Renato introduces some of the upcoming new content. and talks about some of the new features coming to Automobilista V1.0. On the bottom of this post, you can also listen to a sound preview of the Chevy V8 engine in the back of the Ultima GTR that will become available in one of the upcoming DLC cars for Automobilista! A couple of weeks back we released AMS EA v0.9.8, which introduced some very nice FFB updates, along with the cool new indoor / outdoor Speedland kart circuit. We´ll be dropping out of our usual EA release schedule by not releasing a new EA update this friday, as all efforts are now concentrated towards wrapping v1.0 for an early august release. In the changelog attatched to this post you can see the latest changelog for the v0.9.9 build which is hitting Beta this friday. We are pushing to add to this list by introducing a couple of extra features along with some further polishing before wrap-up time. On the content side, our biggest addition will be the F-Vintage, our own “GPL” celebration of that heroic era in motorsports. As it had been outlined in our AMS dev roadmap, the original plan was to do a single car based off a 1967 spec, V12 powered GP car, however we couldn´t resist spicing things up a bit by adding some diversity to the field, so we created an alternative version of the car by bolting a DFV V8 engine in place of the V12. The late 1960s was of course also a very significant time in racing due to the “discovery” of downforce – we decided to explore that too by creating a low-winged, “1969” season of F-Vintages. We are specially pleased with how the F-Vintage is turning out and fully expect the free addition of these beasts to be one of the main highlights in the upcoming v1.0 release. As usual campaign backers and Reiza members will be able to enjoy an advance peek of the Vintages along with the other developments set to hit AMS Beta this Friday. On the track front, the biggest additions in v1.0 will be the inclusion of several extra layouts to existing tracks, the biggest one being the “long” 7km version of Mendig, which exits the airport to travel through the nearby village roads. On the physics front, we´re working on the development of a brand new ECU model as conceived by @Niels Heusinkveld, which should provide a lot of important enhancements. So far, we’ve made considerable improvements to the way engine torque is generated as you ‘roll on’ the throttle, simulating the more advanced “throttle mapping” techniques from modern ECUs. 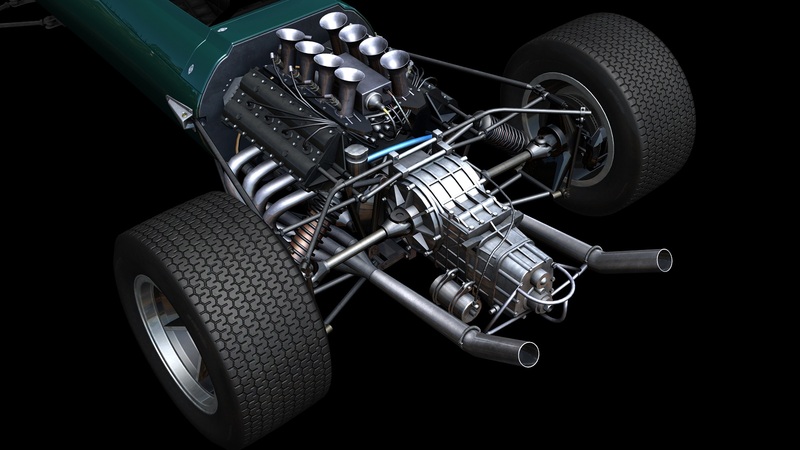 Most noticeable in modern high powered cars, basically this will translate into more control when powering out of turns, as it will be easier to find the throttle position where you get the best acceleration without lighting up the tires in wheelspin. Your throttle ‘technique’ may need some adjusting though as the engine responds more directly at smaller throttle inputs. The new model also allows us to do a few modern computerized engine control tricks such as changing power levels and engine braking for each gear. 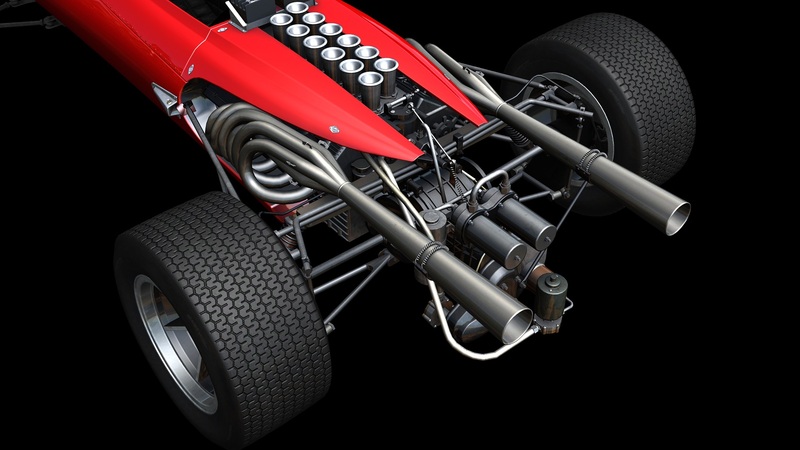 With the Formula Extreme up to v0.9.8 for example it is very tricky putting 900hp to the ground in 1st and 2nd gear, as you can very easily be turning half of that into white smoke. By limiting the engine power, it will be easier to optimize power delivery. Engine braking can also have quite a disturbing effect on the balance of the car – this is specially so as you go down the gears, because the gearing amplifies the engine braking the more you downshift. The new model allows us to reduce engine braking in low gears so the rear end is less likely to lock as you’re downshifting and entering a turn. This is all ‘passive’, not traction control so naturally you´ll still spin the tires by giving it too much throttle, but it may only happen at 70% throttle instead of 35% throttle which should be a big driveability improvement for the more powerful cars – a case of the sim becoming easier as models are developed to be more realistic. We are pushing to have at least the throttle mapping side of the new ECU mode ready in time for v1.0 release. Things continue to progress nicely in the DLC front – Brands Hatch is now nearly complete and the team is well advanced with Cadwell Park. During our Cadwell recon trip @Alex Sawczuk trialed a new method of surveying race tracks for increased accuracy. We used a digital level to take camber and elevation measurements at set points around the trace track and then using that data calculate the elevation changes. This allows us to get an accurate profile for the track, as well as its camber changes. We have also been using a laser measure along with good old basic tape to make all the key measurements, which coupled with Alex´s usual meticulous precision have led to some pretty hard to fault road modelling. The cars are also coming along nicely – our audio man @Domagoj Lovric has added the soul to the Ultima GTR with yet another lovely sound set of its throaty Chevy LS7 V8. Both Ultima GTR and MCR Sports 2000 will soon be joined by a variety of Caterham models which had also been previously confirmed to be part of the Brit Pack – unlike previously announced though the Brit Pack won´t be restricted to these 3 new classes of vehicles, as another bonus car has been added to the list – watch this space! We´re pushing to have these initial items of the Brit Pack available before the end of august, with beta a couple of weeks earlier. We´re very happy to confirm official licensing of the legendary Enzo & Dino Ferrari race track , which will be coming as its own premium DLC pack for Automobilista. Legendary tracks become such after decades of rich racing heritage – we believe that in order for a sim to capture the history of corners such as Tosa, Tamburello and Rivazza it´s fundamental to reproduce those famous bits of terrain through the times, and race them with machines that belong to those eras. 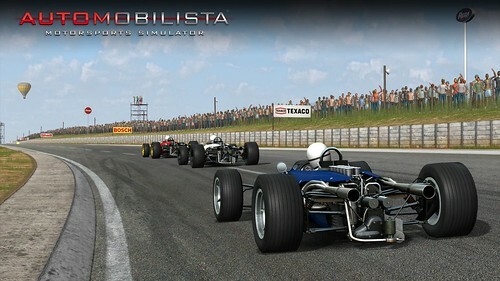 Hence Imola will be the first of our “Legendary Race Tracks” line of DLCs, and will feature no less than four unique versions of the track: from early 70s, late 80s and early 00s, along of course the modern version of the track. This pack is estimated to sell for US$ 6.99, with release expected to be towards the end of october. Worth remembering that those who took part in our crowdfunding campaign last year or bought into our membership pack have already secured all these upcoming DLCs at no extra charge. Those interested in securing all this content and also a chance to give the new stuff an early go should look into our membership packs from our forum store. Automobilista base and the membership pack (both all-inclusive and ugprade options) remain with their promotional Early Access pricing in our forum store, selling for US$ 29.99 / US$ 54.99 / US$ 24.99 respectively – upon v1.0 release these prices will be upgraded to US$ 39.99 for AMS Base, US$ 59.99 for all-inclusive and US$ 29.99 for membership upgrade, so if you´re interested in AMS or in the DLCs at all you won´t want to miss out on these current offerings. We´ll be offering a similar “Season Pass” for all DLCs through Steam upon v1.0 release along with options for the individual items and packs as they become available – the best deal however still is to acquire the membership packs which not only includes the Season Pass for all DLCs, it also grants a key to AMS Beta and access to Reiza51.